Top Spin Snooker Video Slot Review - Casino Answers! Top Spin Snooker is a 5-reel, 9-line video slot developed by Random Logic, featuring a wild symbol, scatter wins, a free spins feature and a bonus game. You can play the Top Spin Snooker video slot at Bovada. 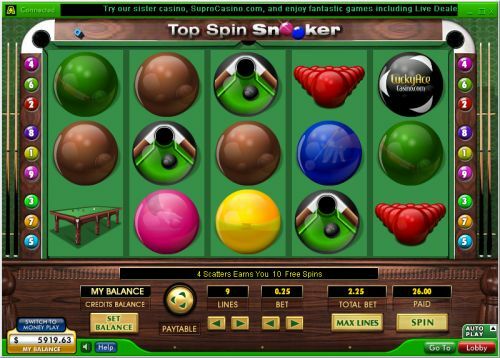 Bets on the Top Spin Snooker slot machine are $0.05, $0.10, $0.25, $0.50, $1, $2, $5 and $10 per line. You can select from 1-9 paylines. You can bet anywhere from a nickel per spin up to the maximum total bet of $90 per spin. Top Spin Snooker has a good betting range that is suitable for casual players and high rollers. To play the Top Spin Snooker video slot, select your bet and press “Spin” or use “Max Lines” to play all 9 lines. 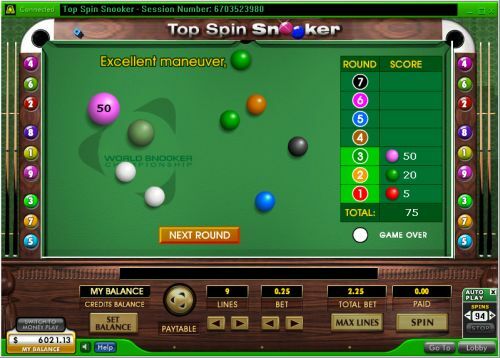 The highest paying symbol on the Top Spin Snooker online slot game is the Table. If you land 5 Table symbols on a selected payline, you will win the 8888 coin top jackpot. The second highest paying symbol is the Pool Cues symbol at up to 1470 coins. The Pocket symbol is wild and will substitute for all symbols except for the scatter and bonus symbols. The wild symbol will not pay out by itself. Use this symbol to create new winning combinations at Bovada! When 3, 4 or 5 Scattered Rack symbols appear on the reels of Top Spin Snooker, you will win 5, 10 or 20 free spins. Free spins will have the same number of active lines and bet per line as the original game. All prizes, including additional free spins (which will be accumulated to the existing ones, infinitely) can be won during the free spins feature. Open up the Top Spin Snooker autoplay mode by pressing the Up arrow on the “Auto Play” box. You can play up to 99 autoplay spins on the Top Spin Snooker video slot. You can stop the autoplay mode at any time by pressing the “Stop” button. We think fans and players of snooker will really enjoy the Top Spin Snooker video slot. It has a very good top payout, a free spins feature and a bonus game to offer! You can play the Top Spin Snooker slot game when you sign up and make a deposit at Bovada! Can players from the USA play the Top Spin Snooker video slot? No, American players cannot play the Top Spin Snooker slot machine for real money at this time. You can instead play the very fun and exciting video slots over at Bovada Casino!